Don't let your lungs be the ONLY air purifier in your home! 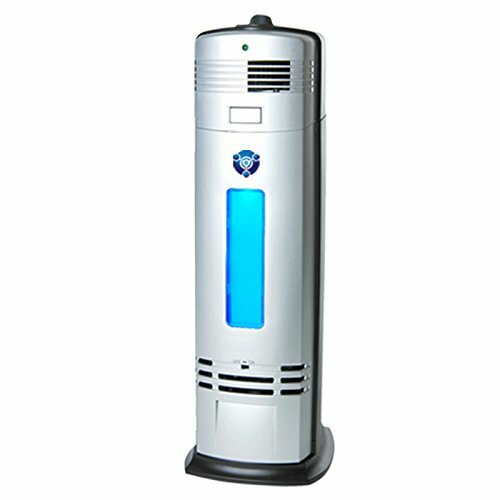 This durable ionic/electrostatic air purifier utilizes ultraviolet germicidal irradiation (UVGI) technology to sanitize the air, carbon filtration to reduce odors and electrostatic purification to remove and reduce airborne pollutants and irritants so you and your family can breathe easier. Key Features Include: Permanent Electrostatic Dust Collector Rod: Easy to remove and clean. Just wipe clean with a damp cloth. Permanent collector rod never needs replacing. UV-C ultraviolet light: Kills germs and bacteria to sanitize the air. Night light function with an on/off switch. Washable charcoal filter: Reduces odors. Ionic technology: Generates negative ions (O1) to remove pollutants and particles as small as 0.01 microns (0.4 micro inches) from the air. O3 (ozone): <0.05 ppm. Ozone can kill germs, deodorize and freshen the air. Power: 12W, 110V AC to 12V DC adapter included. 2 fan speeds: Low (quiet for sleeping), High (for increased air circulation). Size: 17"(H) x 6"(W) x 7"(D). Satisfaction guaranteed: 30 days unconditional replacement or refund if you are not satisfied. Factory Warranty: 1 year. ETL Intertek, UL, and ARB certified! If you have any questions about this product by OION Technologies, contact us by completing and submitting the form below. If you are looking for a specif part number, please include it with your message.